In his New York Times best seller, Good Calories, Bad Calories, Taubes argued that our diet's overemphasis on certain kinds of carbohydrates - not fats and not simply excess calories - has led directly to the obesity epidemic we face today. The result of thorough research, keen insight, and unassailable common sense, Good Calories, Bad Calories immediately stirred controversy and acclaim among academics, journalists, and writers alike. Michael Pollan heralded it as "a vitally important book, destined to change the way we think about food." Taubes reveals the bad nutritional science of the last century, none more damaging or misguided than the "calories in, calories out" model of why we get fat, and the good science that has been ignored, especially regarding insulin's regulation of our fat tissue. He also answers the most persistent questions: Why are some people thin and others fat? What roles do exercise and genetics play in our weight? What foods should we eat, and what foods should we avoid? If it is so obvious to reach a weight loss objective through a carbohydrate deficiency then why are there so many obese people that go to the gym, this to me clearly states that there is an obvious nutritional knowledge defecit that even personal trainers don't seem to understand or are reluctant to share with their clients. Day after day though these commited individuals will try to lose weight by burning calories and then try to restrict caloric intake through the use of will power. Gary goes over many cases in which different societies have become obese and aludes to their adherence to more 'civilised' feeding habits as the cause for their poor health. I think that it is necessary to go into the detail of where we as human beings became more and more reliant on such a simple and non-essential nutrients and how this reliance has affected us as humans. The book gets to the point very slowly, however, changing habitual behaviour for some does require research based evidence and this is about as close as you're going to get in an audio book format. 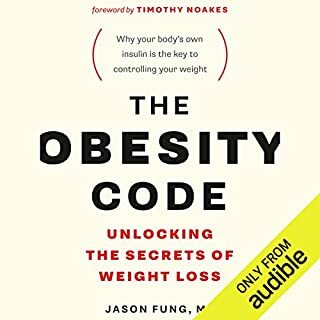 I strongly recommend this audiobook to anyone that has been trying to lose weight through dieting or is struggling to stay on their strict caloric restricted regime. Will power will only get you so far! I read the book, but I wanted the audio version to listen to in the car and on the go. This is information all Americans need. We are eating a diet which will kill us in the end. What we thought as the normal American diet is going to be our undoing!! We didnt' know... but now we do. All the research is interestingly provided to us and one cannot listen to this without realizing a change has to be made. I have lost 30 lbs so far, and expect to reach the proper weight for my height paying attention to the research presented in this book: a low carb diet is the healthy way to go--- carbs are for special occasions, and great care should be taken to eat the right ones in the right amount. It's been fairly easy and I am so grateful I found this book when I did. I have heard the information before, but I never knew WHY we needed to eat low carb. I guess I am one who has be convinced, and convinced I am! 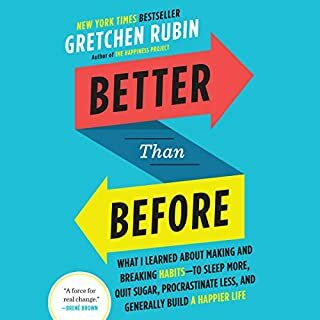 I agree with the one comment about this book is just more or less stop eating and drinking carbs, but I am glad I GOT this book anyway because its more than that. It is nice to finally understand how the body really works around getting fat and why we get fat and the logic behind so many myths and other diets and why things don't work, fail or fall short of losing weight. So it was refreshing to get a handle on why it is a good idea and what happens when we eat and drink carbs along with our HDL and LDL levels and how that effects our cells and our problem with getting fat. This book is going to really help me and finally help me change my life around as far as why I am always struggling to lose the weight and I now see how I have been failing and why. Its worth the price, no problem. Thank you Gary Taubes. Are you looking for an attachement for the book? You can find accompanying attachment on the bottom of "Publisher's Summary" which is on the top of the page for the book here on Audible. The link says "Download the accompanying reference guide". I have to admit it was not obvious place to look and took me few minutes to realize it was there. Eye opening, life changing book! This audio book is about to change my life. I have struggled with being overweight all of my life. As most people like me, I have tried every diet, at least once. I'm here to tell you that they all work, as long as you stay on them. I have always had these nagging questions in my mind...Why me? Why do I eat less than my thin husband, and not lose weight, What diet is best for me and why are there so many of them? What is the actual reason that I get fat, and stay fat, and others don't, when their lifestyle and eating regimes are similar to mine? This book answers it all, and goes a step further, maybe more times than necessary. Just as there is a scientific reason and solution for many things, there is the same for obese people. The answer is here..it might not be the answer you want, but it is here for you (and mainly me) to take it and run with it if you truly want to change your life enough to embark on it! Thank you Gary, for your hard work and passion, to put this extremely valuable information out there for me! Finally a scientific explanation for why we get fat! I could not put this book down from beginning to end. Ultra informative. Ever wonder why the Adkins diet works? This book thoroughly answers all your questions in detail. I thought this book was life altering and a totally satisfied any questions about WHY we eat the way we do and what affect it has on us. I knew I had to change my eating habits - yes, I'm overweight and would like to lose weight but I wanted to stop the continuous eating and the amounts I was eating. I couldn't understand the constant need to put food in my mouth - sugary food, cakes, biscuits, sweets etc. Gary Taubes explains very clearly (albeit repetitively!) that what I am eating is slowly but surely destroying me and all I can look forward to as I get older is diabetes, heart disease and obesity. It's not going to be easy to change my eating habits but in order to get well and stay well I have to - it's not about the scales or my clothes fitting me, it's about living and feeling well. I now have the clarity and understanding that I was missing before and it's thanks to this book. 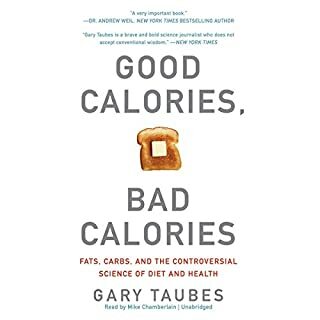 Taubes has made quite a stir with this and its more technical predecessor "Good Calories, Bad Calories" but he's not going away. Instead his arguments and logic only get stronger. This book is perfectly accessible as it lacks the excruciating detail of "Good Calories" but still contains the meat of the information (no pun intended). 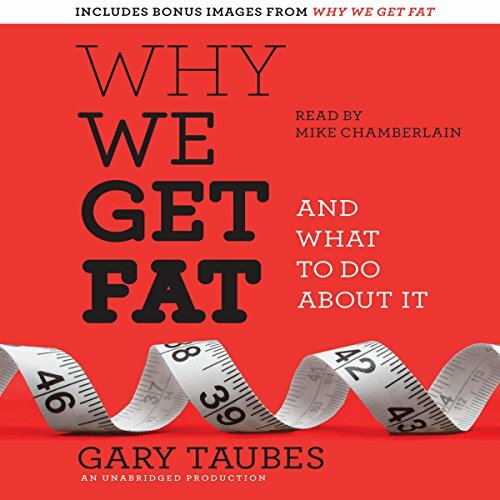 It is not a diet book, and Taubes is not selling a diet plan. And he's not a research scientist or a doctor with some academic dog in the fight. He's a renowned science writer with a history of credibility. 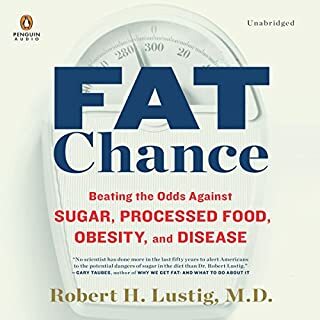 He presents the history of how we came to the place where we're at now - an epidemic of obesity compounded by some very, very bad advice from the highest ranks of the medical community. Lots of people have asked for the accompanying material. It seems to be very essential while going through this book. I myself am only at chapter 6 and decided to send an email to Audible customer support about the material. I can't say for certain that the material was available before I requested but all I can say is that it is now available towards the bottom of the book description area for the book on the website. The download link is http://download.audible.com/product_related_docs/BK_RAND_002472.zip. Normally I can get by without any additional material but If you haven't read this book yet I encourage you to get the material as well and if possible refer to it before you start the book. I think it makes a big difference in this case. So far the anti "calories in calories out" argument is being beaten to death in this book, i say this because I never really subscribed to this approach anyway, but it is good to know that it can be beaten to death with real evidence as opposed to anecdotal evidence from my own personal experiences. Very engaging book, so far. (I take one star off for the beating to death of the topic). If you need inspiration to get you going on dieting for 2011, this will do it! Although the basic principles are known to those of us who are avid readers on how to lose weight, and this book essentially covers those basics, this author is very good at explaining difficult material such that all can understand. Further, there is a surprising twist that leaves one with an "Aha" experience. We all know which foods we should cut out, but do we REALLY understand why? If not, then one is not really motivated to do what is necessary. This author motivates! I really appreciated the narrator's slow careful enunciation of this difficult material. I don't do this... review purchases. This time I've made an important exception. WIth a keen interest in personal fitness and health, I've been interested in nutrition for the last twenty years. Although not particularly overweight, I'm very aware of the sacrifices that the majority (of which I am one) make to keep healthy and trim. I've read the magazines and followed the fads and routines over the years. I even qualified as a fitness instructor and particularly enjoyed the nutrition element of my training. Central to common accepted 'understanding' on weight loss is the tenet that if you don't burn off the calories you put in, you gain weight, and vice-versa. This book destroys this myth. 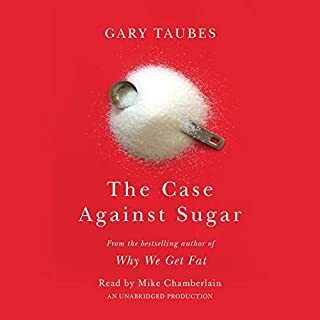 With reasoned argument that is backed with research by world renowned academics and institutions over the past one hundred years, Taubes explores carbohydrate consumption, Glycaemic index, insulin secretion and their effect on the body. The result is knowledge which I've applied to the way I eat (not 'Diet') and followed for approximately two months. I've lost 12 pounds in weight ...easily. I haven't even exercised as much as I might. I've never been hungry, eaten as much as I want, and have enjoyed all that I've eaten - all in the knowledge that not only am I slimmer, but the information offered with have a positive affect on my risk of diabetes, heart disease and health in general. Having read 'Protein Power' a number of years ago I already knew how bad carbs were and that it's them rather than fats that make us fat. However reading this book will completely change the way you think about food; or at least it did with me. Gary explains in great detail that we eat because we get fat, the conventional wisdom is that we get fat because we eat. 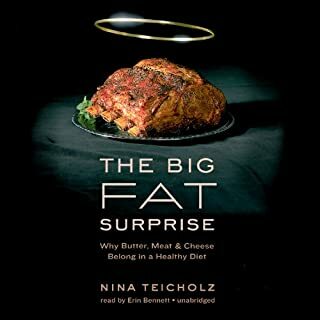 If that doesn't make sense now then read this book; for those of you who are overweight maybe its time to stop blaming the obesity epidemic on gluttony or your own lack of willpower. Please note, this is not a diet book and I agree with Gary Taubes that diets just don't work, at least not in the long term. Having said that, I lost a large amount of weight after reading this book because I changed what I eat rather than how much I eat. I don't see that there's an end point or a target weight to be reached, after which point I'll go back to my old bad eating habits. This is the diet trap and one of the many reasons they fail. This book will debunk years of dietary myths and completely shatter the hypothesis that high fat, high cholesterol diets lead to heart disease and obesity. I was trying to think of a particular demographic for whom this book is essential reading but actually it's essential reading for everyone. Whether you're a parent trying to make the right food choices for your kids, suffering from obesity or just plain health conscious; buy this book and change the way you think about food forever. I had no idea. And now at least four of my friends are just as stunned after buying their own copies. If you've ever wanted to lose weight. If you've ever struggled to be slim, PLEASE try this book. I've listened to it three times so far and I'm still learning. This is a very informative book, I have read everything there is about health and weight loss etc but I found this one really laid it down in plain English while not skimping on any of the necessary science and information. It's not really a diet book as such however the advice on how to eat to deal with the issues you may have regarding insulin regulation is extremely helpful. I will definitely be recommending this title to friends and family as I think it's basic advice that everyone should know regardless of whether they have weight issues or not. I have listened to this book three times over already, It is quite simply a revelation and it gets better every time I listen. I have changed my lifestyle and I am losing weight because know I understand why i couldn't lose weight before, despite a whole number of different diets. I cannot recommend this book highly enough, everyone should have the chance read it or hear it. Awesome. Do not diet without listening to this first! A straightforward take on a really simple concept. I listened to this while on a VLCD and it makes more sense than virtually everything else I have heard - not so easy to follow but with the tools available you are then empowered! Definately worth listening to if you want to control your weight in the long term. if you can just drop all you probably believe now about dieting (don't worry reasons are given on why you may wish to change your mind). So many of us (I'm definitely including myself) have tried every diet under the sun and beat ourselves up when it doesn't work or the effects last. I had a long drive ahead of me last week and thought an audio book (first for me) would be ideal - I wasn't wrong and in general would recommend audio books but I didn't expect the content of this one to be so facinating! Am trying the diet outlined - so far no craving of carbs (which is amazing). I used to think I was in a habit of eating every hour or so and that I was a 'grazer' however within only a few days I can now (with the knowledge of the book) see that I was only responding to my body's craving for carbs (the more of them you eat, the more you want) - whether you are hungry / need them or not. I feel positive with this level of control and we'll just need to see how things go re my inches / weight as time progresses. Far too early to comment on that one at present. I'd highly recommend a listen to this audiobook though - then you can make you own mind up on what you believe. One minor downside is repetition - which is generally across chapters and I suppose is to be expected if you want to be able to read each chapter in isolation - or it may be a method of pressing the point being made! Absolute must listen, well researched and presented, well read. Loved it! i enjoyed this book. great information and having been on a high fat high protein diet with minimal to no carbs, i can agree that it works. very factual and alot of reference to science. do yourself a favour and actually research the info yourself. This book was fantastic. Highly recommended! Lots of science but made interesting and easy to understand. Very informative and has convinced me to start a new journey with diet. Having a background in science and nutrition it all made sense. Can be repetitive and long winded at times however worth sticking it out, I found it best to have breaks between chapters to digest and not lose the message. I have changed my diet since listening to this book and have lost 4kg without restricting calories or feeling hungry plus lost 12cm around my waist. For me it put all the pieces of the puzzle together. Possibly could have had a better finish/conclusion as I found it ended abruptly but overall gets a 5 stars from me. An excellent book. Detailed and factual. Highly recommended. The tide is turning! Well done Gary Taubes. Interesting and illuminating. Worth a listen if you like to understand the science behind weight gain and loss. Confirmed what I already knew! Loved it, confirmed what I have been learning over the last decade. Technical enough to qualify info, yet easy to read and take in. Highly recommend this to anyone who has tried every diet on the planet! It seems as though the book is written to convince those with 'old school' understanding of nutrition and fat gain, and reiterates the same message over and over. once I skipped through, I was pleased to find the later chapters informative and useful. There were a number of statements I didn't agree with and the information and references are heavily biased, but it was a good listen and I definitely took something away from it. In a nutshell the author suggests and backs it up with scientific data that if you wanna lose fat say No to carbohydrates and YES to fats and protein.